Welcome back to the fourth and final part of NC or NP! If you’ve stuck with us this long, you know that Fuz (sinistrous) and I have spent the past few weeks taking a look at popular neocash wearables, and suggesting neopoint alternatives to achieve the same look for less real money. While we fully support the NC Mall and love the flexibility and variety it offers us for customizing our beloved pets, we realize that not everyone can use the Mall as we can. Some people live in countries with no access to the mall, so neopoint wearables are the only way to go. Some people don’t have the budget to include nc in their neopets playing, and that’s fine too. Some people won’t, and that’s their prerogative too. For some others, neocash is great – for their main account, but they want to customize their side pets too. And for others, the neocash item in question is simply too hard to find and expensive. Whatever the reason, we hope we’ve opened up some customization options for you. In this last section, we’re going to take a look at trinkets, garlands, etc. These are usually the last thing we add into a customization, so it made sense to work our way down. We hope you enjoy – here goes! For the perfect touch to a mysterious or spooky look, a tombstone in the lower foreground is sure to please. Many neocash lovers love Here Lies Fluffy for this look; a classic tombstone in the static shot shown on look-ups, it fits the bill pretty well. But personally, we think the neopoint alternative of the Broken Heart Tombstone is pretty swell. It may be a little more directed than Fluffy because it shows hearts on the tombstone, but for 22k we think it’s a total steal. More spookiness! When the Tombstone Foreground came out in JubJub Power Bounce last October, it caused a stir and was instantly popular. Personally, it’s part of the permanent customization for a couple of my pets – it’s a very well done piece! But the neopoint version, Malevolent Tombstones, is equally well done. For 105k, it will give your customization a very similar feel. If it’s time to camp outside, your pet will without a doubt need a campfire. And to be perfectly honest, we have a hard time telling these two apart when you look at a static image. Tyrannian Bonfire has nice animation, but if neocash is a no-go for your look, the Campfire will cost less than 25k. Oh, Inconspicuous Gumball Machine, you’re so cute, but WHY must you be so rare and hard to find? (Okay, yes, we know why... it’s an old item. You’re missing our point! –sobs–) Even if you can/will/do use neocash, this item can be rather hard to find. But for that cute candy look, fortunately there’s a neopoint alternative – and it will cost you less than 300 neopoints! The Abigail Gumball Machine is pretty cute in our opinion, and helps you get that same yummy vibe. The Weewoo Bath is easily one of the most popular little neocash trinkets, and with good reason; it’s simple yet elegant, with under-stated animation, and, let’s face it, it has a Weewoo. But like the Inconspicuous Gumball Machine, it’s an older item and can be hard to find even for dedicated mallers; fortunately, an Anubis is pretty cute too, don’t you think? We do, and for less than 50k this pretty little fountain can be all yours. If your pets love the Day of Giving and all its attendant festivities, some holiday trim is a must. The Cheery Holiday Garland is a long time favourite of neocash users, and with good reason; it’s both festive and adorable. But for those who prefer to (or need to) customize with neopoint items, the Kelp Holiday Garland came out from the Advent Calendar a few years ago. 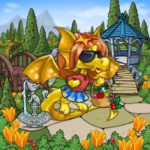 Despite having “kelp” in the name, it's definitely cute in all Day of Giving Customizations and a neopoint alternative we love. As a bonus, it’s less than 10k! Feet in the Clouds Foreground came out at the end of last year’s summer JubJub Power Bounce season and was pretty much an instant hit; even when you could win it in the game it commanded a pretty high trade value. Now that it’s been retired for a year, it’s expensive and extremely hard to find. While the Cloud Garland isn’t a perfect substitute, we really like it; it gives a nice fluffy feel to the ground your pets stand in. We actually like the zoning of the Cloud Garland better, too – while Feet in the Clouds occupies the lower foreground zone, the Cloud Garland is a background item. At around 80k the Cloud Garland really isn’t cheap, but we think it’s worth it. Spring is in the air, and how better to celebrate than with flowers? Neocash abounds with beautiful flower lower foreground items; Pretty Tulip Foreground and Colourful Daisy Foreground are only a couple. And while they’re lovely, flower foregrounds are hardly exclusive to neocash customizing. The Thicket of Flowers will run you a few million neopoints, but it’s a stunning item. For the slightly more budget conscious (ahem... broke... ahem... US! ), the Flower Petal Foreground that was a recent Festival of Neggs prize is only around 10k and has some truly lovely colours. Well, that brings this four-part series to a close. We hope it’s expanded your neopoint options, or even your customization options in general. (And probably made you a little broker too, but for the perfect outfit... it’s totally worth it, right?) Thanks for reading – happy customizing!